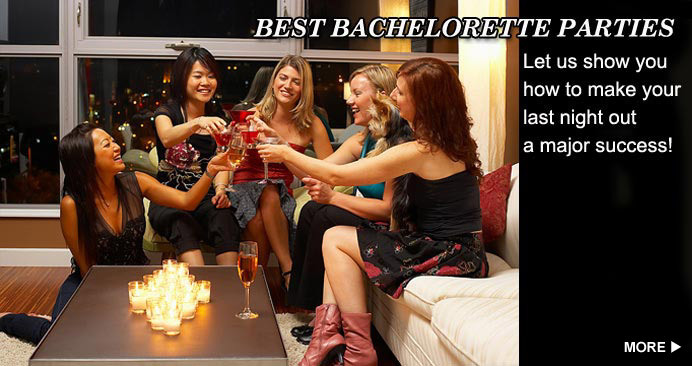 Bachelorette Parties 101 is your number one source for planning a successful party. Our free information will help you plan every aspect including supplies, pictures, ideas, games, party favors and bachelorette gifts. From supplies to party games, we'll help make your bachelorette parties a very memorable one, and will help handle your last night out needs! We have the best selection of bachelorette supplies to choose from. We will show you the newest in bachelorette supplies and favors. Bachelorette party pictures can also give you great ideas. Check out our bachelorette party picture section to see from mild to wild. Bachelorette Parties Rule 1: Dress the Part – Make sure to let all the bridesmaids know the dress code and theme for the party as early as possible so everyone can get all sassy’d up to make your presence known! Bachelorette parties are best when all the girls dress in uniform, whether all in black, red or in a theme like sixties, disco, playmates, etc. Let the girls know ASAP so they can plan ahead and have fun coming up with the costumes! Bachelorette Parties Rule 2: Wear Comfy Clothing – Don’t wear heels that kill your feet but look good. Make sure your wearables are comfortable so you have an awesome time. There is nothing worse than wearing uncomfortable heels, too tight of clothing that cuts off circulation or an itchy shirt or skirt. Also pay attention to the weather so you don’t freeze your bottom off. Plan ahead and party in style and comfort! Bachelorette Parties Rule 3: Where’s the Money - Credit Cards and/or Cash – Make sure you have some cashola to bring to the bachelorette party. It is a buzz kill when friends have to cover you (unless you don’t have the funds and someone is covering you, knowing prior to the Last Night Out). Find out as early as possible what is included in the bachelorette parties events prior to the extravaganza to figure out what you should bring as well as a credit or debit card. Bachelorette Parties Rule 4: You Deserve the VIP Treatment – Places offering bachelorette parties volume discounts are plenty in this economy as well as receiving top treatment for your last night out group! Call as early in advance as possible to any special arrangements you are making for your bachelorette parties and let the venue or entertainment company know what you want or what your vendor can provide your group to see who “wins” your business. Bachelorette Parties Rule 5: Less is More – Think in advance what you want to bring and carry to the festivities, especially if you are drinking alcoholic drinks. Don’t bring a purse that includes the kitchen sink. Bring only the necessities and you will be less concerned about losing your favorite digital camera, Coach or Fendi accessory. Bachelorette Parties Rule 6: Don’t be the Stinky Bachelorette – Make a great first impression as a group by smelling the part. Don’t forget wearing deodorant or perfume (a few sprays and not overbearing). Bring a mini perfume bottle and a mini deodorant just in case one of the girls forgets to take this advice or if you are dancing or in hot room. Bachelorette party mints are also a must, especially if you are going out for the night. Bachelorette Parties Rule 7: Re-Glamorize – Bring your must have “essentials” of beauty during your last night out, especially if you are out of town and/or blazing a dance floor. There are nothing like basic touch ups after a few hours into the bachelorette party which will make you regain diva status once again! Bring enough for those who also need a tune-up and you will be on everyone’s favorite list. Bachelorette Parties Rule 8: Bachelorette Decorations, Bachelorette Supplies and Bachelorette Games – Those bachelorette parties that dress up the room and bride-to-be are usually the most memorable. Make the party festive and interesting with bachelorette party decorations, supplies and games. Plan as early as possible and you can find great deals to add bling and glam to your last night out! Bachelorette Parties Rule 9: For the Bachelorette – An important tip to remember is to plan a party around the bride-to-be’s interests, not what makes the bridesmaids happy. If the bachelorette is conservative, don’t try to overly embarrass her so she dreads her own party and is embarrassed about the bachelorette party pictures. Include her interests and temperament so she can enjoy her own last night out! A male dancer may be too uncomfortable yet a home party with generic plates may bore her. You know her interests, so plan her party with the right elements. Bachelorette Parties Rule 10: Don’t Drink and Drive – This is the most important of all the blunders. No one wants to have a memorable time that includes a totaled car, DUI, and possible injuries. Make sure to plan ahead with sober drivers, a taxi, party bus or limousine! You will have a more enjoyable party without the worry. Bachelorette Parties Rule 11: Cellularitis – Bachelorettes don’t let bachelorettes stay on cell phones for the majority of the bachelorette parties. Whether you are speaking to a boyfriend, husband, sorority sister or grandma Rose, make sure to be sensitive to being present with your friends at the party and not staying in cellular hell. It is a major buzz kill to those party-goers around you and also rude. Have fun in the moment with the other bachelorettes and focus on the bride-to-be (unless she is the one on the phone). Bachelorette Parties Rule 12: Show Your Beautiful Face – Wearing bachelorette costumes is popular at bachelorette parties. Just make sure to not cover up your pretty faces! The last thing you want to be looking like is a clown. Choose a costume that gives some sassy appeal, even if in funny bachelorette costumes. It is always fun to get looks that are amusing and positive without those that are embarrassing. Bachelorette Parties Rule 13: Don’t be Offensive – If you normally have a trucker mouth or have someone present that likes to drop F and A bombs, try and tone it down with some appropriate diva talk, since you are one of many that represent the group. It would be sad for party people to banish the bachelorette party or an individual diva due to a filthy mouth or obscene gestures that are not in good taste. Also stay away from cat fights since drama can be left up to Lindsay, Britney and Paris. Discuss this prior to the festivities and nicely confront anyone not following the code of bachelorette parties (to stay sophisticated yet appropriately wild). Bachelorette Parties Rule 14: Last Minute Planning = Oh My – Bachelorette parties are supposed to be a fun and memorable experience, not a “cram to plan” like memorizing for a final in high school or college exam. Plan way ahead and you will have a more stress-free atmosphere and more organized party. Last minute touches are great for bachelorette parties but not if they are planning the majority of the last night out in an all nighter. Start the buzz of the party by sending out early bachelorette invites with back and forth banter to excite the girls about the up-n-coming party! Bachelorette Parties Rule 15: Bridesmaidzilla – The last thing you want at bachelorette parties is the bride-to-be stressing out or having a bad time at her own party. Check in with her from time to time and see if there is anything see feels is missing. Plan ahead and ask her what types of elements she would enjoy at her last night of partying single. If she is having a bad time, take her aside nicely and ask what can be done to liven up the party for her. It is her big day so make it a great one! I hope these tips for bachelorette parties help in saving you from a bachelorette mishap. Be the hero of the party by printing out this article to other divas to increase the chances of having the bachelorette party of the season and a memorable time with good friends!